Offer small birds a traditional and beautiful shelter in your yard with this Esschert Design Antique Wash Wren Home with Copper Colored Roof. This charming, wooden unit lends a classic look to your yard, while its pitched, copper colored roof adds a bit of shine. The 1" diameter opening beneath the roof allows small birds to enter the piece, and gaps on two sides of the unit offer ventilation. The soft brown tone of the shelter blends with your garden, and the copper colored metal covering the roof has a slight sheen for added dimension. A keyhole opening on the back of the item makes it simple to mount the home to a wall, tree, or post, and the wooden body enhances the natural look. Open the hinged side panel for seasonal cleaning or nest checks, and keep it latched while the home is in use for avian safety. 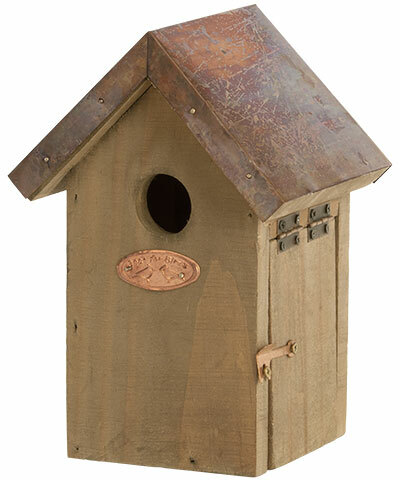 Create a wren-friendly spot in your garden with this Antique Wash Wren Home with Copper Colored Roof.